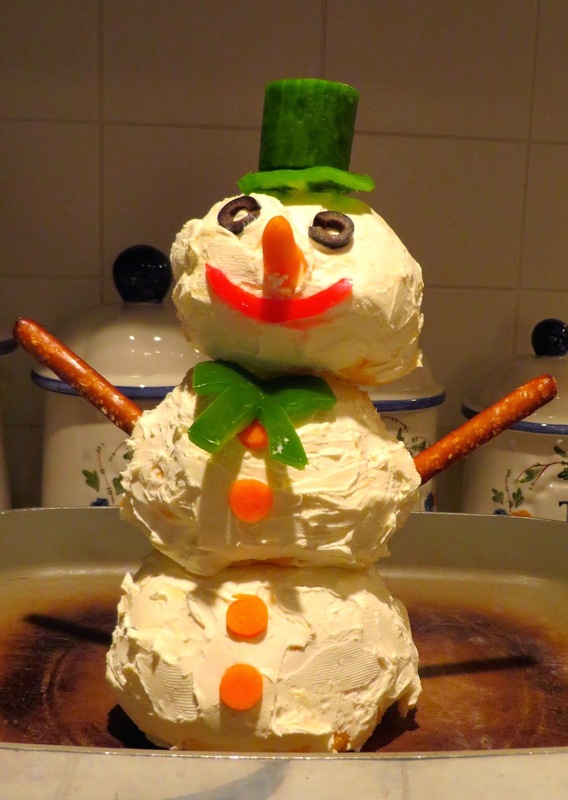 Hello Katie Girl: Meet Frosty, The Cheeseball Man! Meet Frosty, The Cheeseball Man! "Frosty the Cheeseball, was a jolly happy soul, with a pepper bow tie and a carrot nose and two eyes made out of olives!" 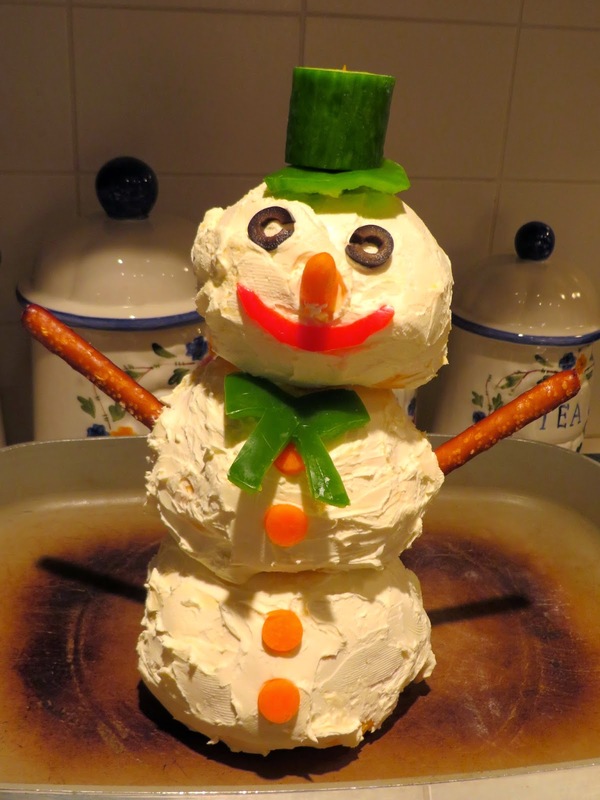 You might think I am a bit off my rocker for creating a snowman made out of cheese (okay, Velveeta, which we all know isn't really cheese), but this idea actually came from a local L.A. celebrity and mid-century modern enthusiast, Charles Phoenix. I met Charles Phoenix at an event last year and since then I have become smitten with his love of collecting Kodachrome slides and his "Test Kitchen" recipes. While most of his recipes are a bit "out there", this one seemed like something I could do and is the perfect dish to serve at a recent holiday party. The ingredients you will need if you want to make your own Frosty are shown below. Frosty is basically three molded balls of Velveeta cheese frosted in Philadelphia brand cream cheese. You can decorate him as you please with an assortment of veggies. I made his bow tie, mouth and the brim of his top hat out of peppers. For the top of his top hat, I used a cucumber. I used olives his eyes and carrots for his buttons and, of course, his nose. For the finishing touch, I used Snyder's large pretzel sticks for his arms. I also ended up using a pretzel stick to act as Frosty's spine to hold him together. You also need an assortment of things to dip in Frosty, which I didn't show here. I picked tortilla chips, pretzel sticks, apples, carrots and celery. Almost anything will work as almost anything goes well with "cheese"! After you have built Frosty, it's time to melt him! I borrowed my husband's Grandmother's electric skillet, but you could also throw frosty into a pot and watch him melt on the stove top. The important thing is to melt him at a low heat of 250 to 300 degrees, because you want to melt, not burn, Frosty, for about a half an hour or so. 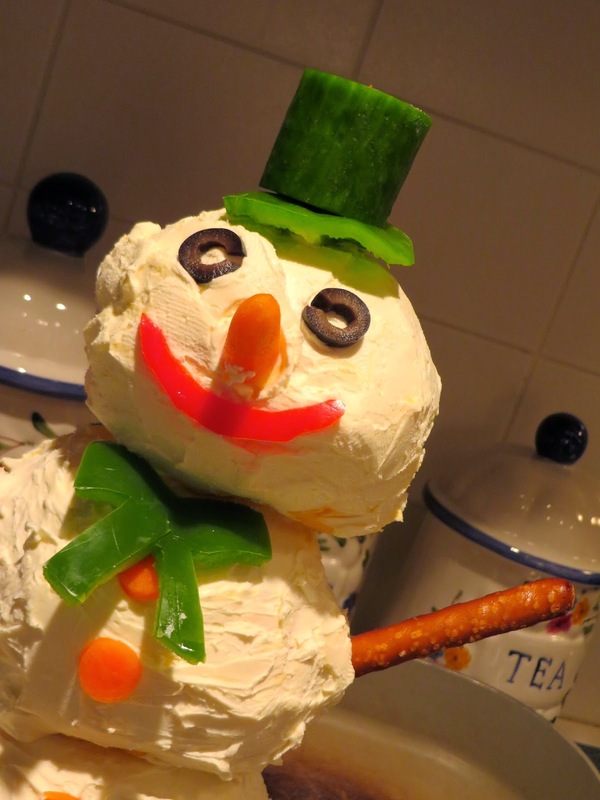 Once he starts melting you can begin to devour him, but it might be polite to say something like "Here's to Frosty!" or "Cheers to Frosty!" with a drink in hand as a toast. My family and my husband were all a little skeptical about Frosty and they all laughed when they first heard me talk about making him. As I was constructing him, however, everyone was in awe and he seemed to possess a magic ability to gather everyone around him in awe! You also might think Velveeta is gross, which it kind of is, but in small amounts it's pretty yummy when melted and gooey. If you would like the complete "recipe" for Frosty the Cheeseball Man, go to Charles Phoenix's website here. In addition to the recipe, you will find a hilarious video of him constructing the snowman with step by step instructions. In loving memory of Frosty. May he rest in peace...in our stomachs!